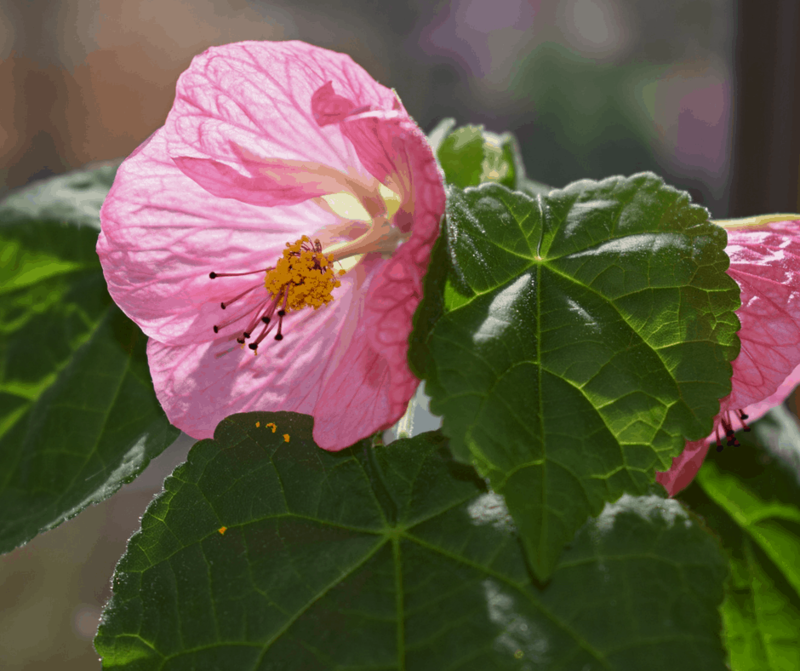 This post, How to Self-Water Container Plants While on Vacation, contains affiliate links. If you click on a link and make a purchase, I may receive a small commision, with no additional cost to you. Summer vacation season is finally here. Now that I’ve got flowers blooming on my front porch in containers, we’re headed to the beach for a week. Great! How will I keep those plants alive? I could ask someone to stop by my house and water my plants, but I hate to bother my friends. So, instead, I’m going to self-water container plants while on vacation. I always spend months dreaming of summer vacations. We usually vacation with the kids and grandkids at our favorite home state beach. We’ve been enjoying family vacations in North Myrtle Beach for over 20 years. Every July, my husband and I spend two weeks on a Caribbean island. It’s our own little getaway for just the two of us. That never happened until the kids grew up and flew the nest. Now, it’s an annual thing. Beach vacations are always a blast and a half. I’m such a beach bum! However, I don’t want to return home to dead flowers and plants after spending so much time planting and watering them. With that in mind, I’ll show you how I self-water container plants while on vacation. It works every time. 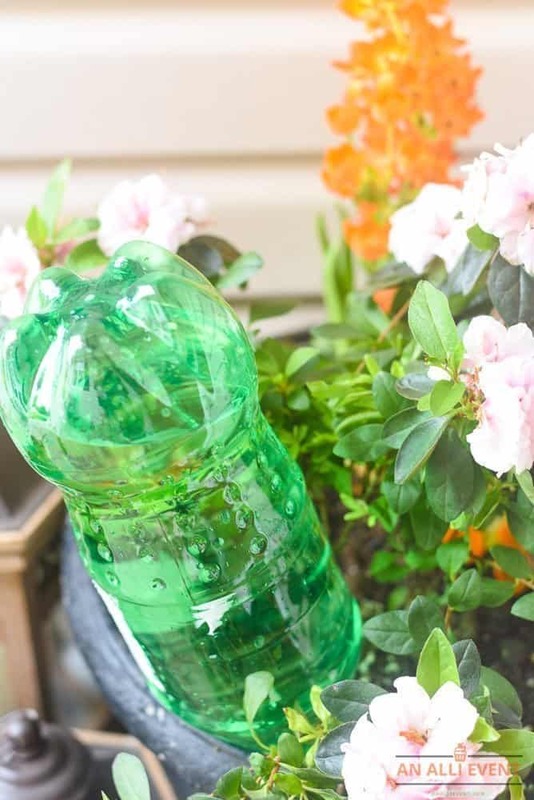 You can use two-liter plastic soda bottles to water your plants while you’re away on vacation. 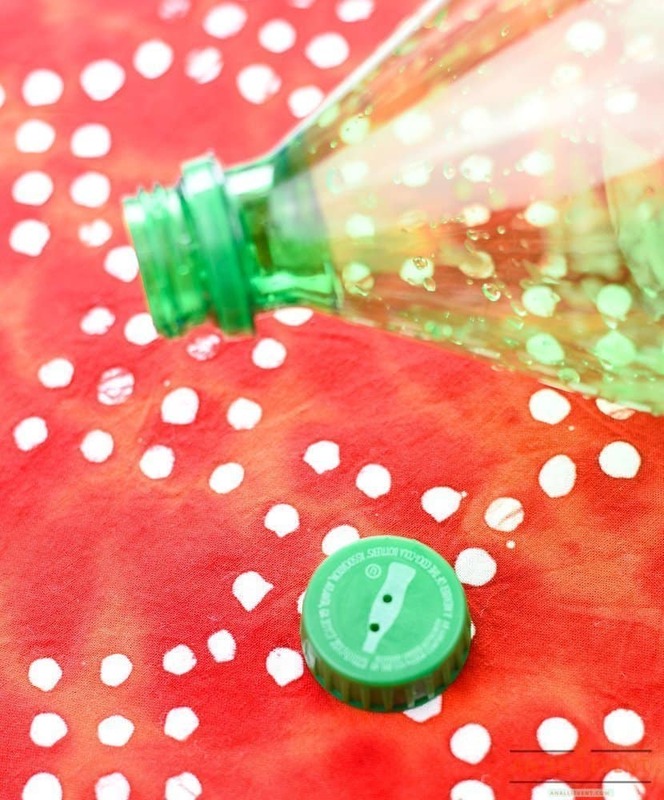 Use a small nail and a hammer to tap the nail into the center of the cap of a two-liter bottle. I went ahead and made two little holes. Oops. I should have gone with one. Fill the bottle with water and screw on the cap with the nail hole in the center. Insert the bottle upside down into the soil, making sure it won’t tip over. Repeat the process with other container plants (one bottler per container). 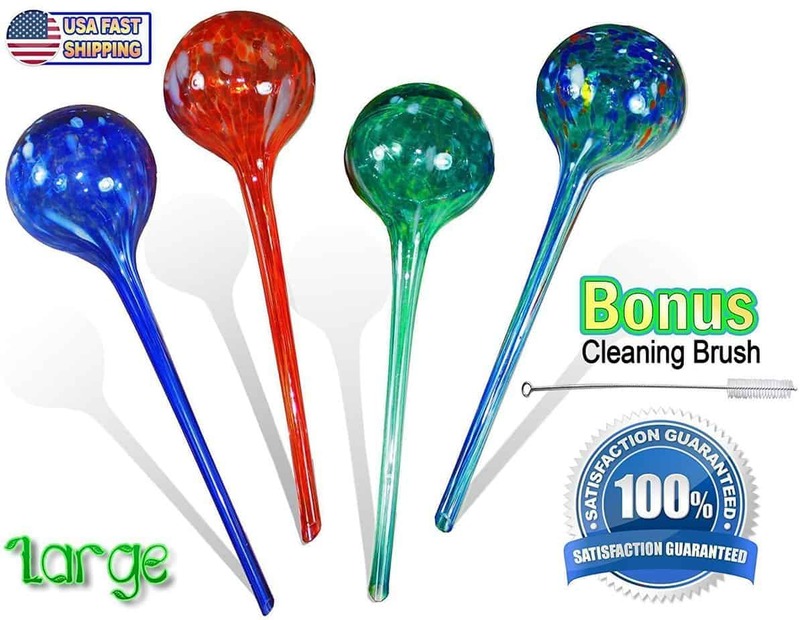 If you don’t want to take the time to make your own self-watering system, grab some plant watering globes. They are inexpensive and prettier than plastic two-liter bottles. 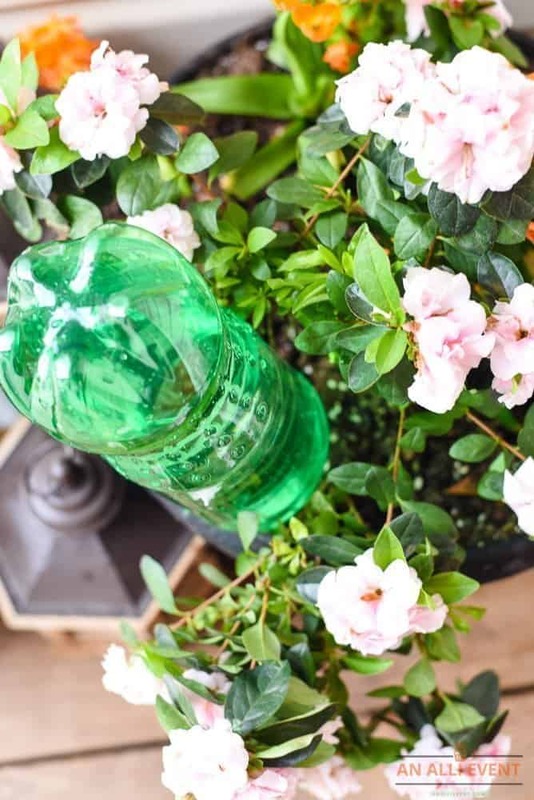 A gallon jug – Place a gallon size jug next to your container plant. Again, saturate the soil well before leaving for vacation. Place one end of the string in the jug. It needs to touch the bottom. Place the other end of the string into the soil at the base of the plant. Fill the jug with water. Make sure the mouth of the jug is above the base of the plant. Sit it on something to elevate it so that the mouth of the jug is higher than the plant base. The water must be able to drip down the string. Helpful Hint: Be sure and use the correct type string. It must be able to hold water for this to work. How do you water container plants while on vacation? Do you get a neighbor or friend to water your plants or do you self-water container plants? Now this is a really neat idea for when we are gone for couple weeks at a time. Easy enough for me to do and my plants won’t be dead when I return. I saw this on a show the other day! Such a genius idea!! I would never have thought of that!! I always wonder what people do for their plants when they go away! This would be perfect for when I go on vacation this summer. Such a clever idea. This would be a perfect DIY project to work on this weekend. I usually just hope that my plants will get watered from the rain when I am away. This system is such a great idea and leaves nothing to chance. I really like those plant watering globes. Not only are they useful, they look really good too. Wonderful ideas and tips for watering while you are gone. I have so many potted plants and its a struggle sometimes. I use the plastic bottle method and it works great. These things are a real life saver. SO many of us travel and need a way to keep the plants alive! This is a nice way to garden and grow plants especially for busy individuals who are not home most of the time. I love the idea of having the spikes to prevent drought. Great ideas! I am so horrible at gardening and keeping plants alive but my daughter wants to start one now that we have a patio and yard. We also travel a lot so this trick might keep my flowers alive a bit longer! All of our neighbors are using the terra cotta spikes. I want to give those a go. Awesome ideas for people who often travel. My husband and I are hesitant to grow plants simply because we love to travel throughout the year. I think this is great solution for that. This is such a wonderful idea. I love my plants but we also travel a lot so this would be perfect. Wow, this is so nice. I never thought of this before and indeed such a great way to make sure our plants at home till receives ample amount of water when we are away. Whenever we go on vacation we always have this issue of tending to our plants. We asked someone to look after them a couple of times. But then we also tried self-watering bottles, though I must admit they were crude, but worked. But what you have written about sound more efficient, will give them a try. This is a genius idea! We are gone so many weekends for tournaments. I will be giving this a try for sure! So many solutions in case you don’t have someone who can look after your plants. I love the ideas and they’re definitely going to give you peace of mind while on vacation. This is brilliant! I’ve always asked my neighbor to water them at least once a month when I’m not at home. This is perfect! I won’t have to ask them to water my plants when I’m away. Ugh why haven’t I seen this before. Thank you so much for sharing this to us, Alli. Cheers! Quite an innovative way to water plants, I also need some ideas to save water. Amazing article . I really enjoy your post. Thanks fro share your article. Nice article.in my childhood days we make hole in a bottle cap and play.